Editor’s Note: this is an image heavy post. If you have a slow connection or trying to see this page on the 3G network, wait to see it. Sorry. 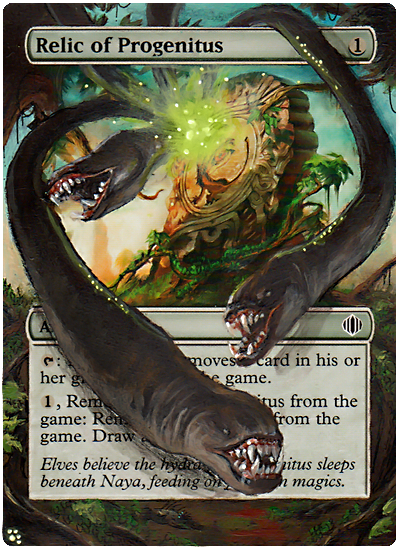 If you’ve been playing EDH for a while, you’ve seen people’s prize EDH decks. Type 1 players have the same need as EDHers: to “Pimp” their deck. No, that doesn’t mean to sell your deck to someone for a tournament so they can play it. “Pimping” your deck comes from the same vein as “Pimp My Ride” the much loved MTV show that spawned a meme. To pimp something is to make it flashy, showy, the “I’m better than you” attitude. Alot of people pimp things out: computers, cars, themselves. In the Magic world, people do it to their decks. Some players love to show off their awesome cards they’ve collected. 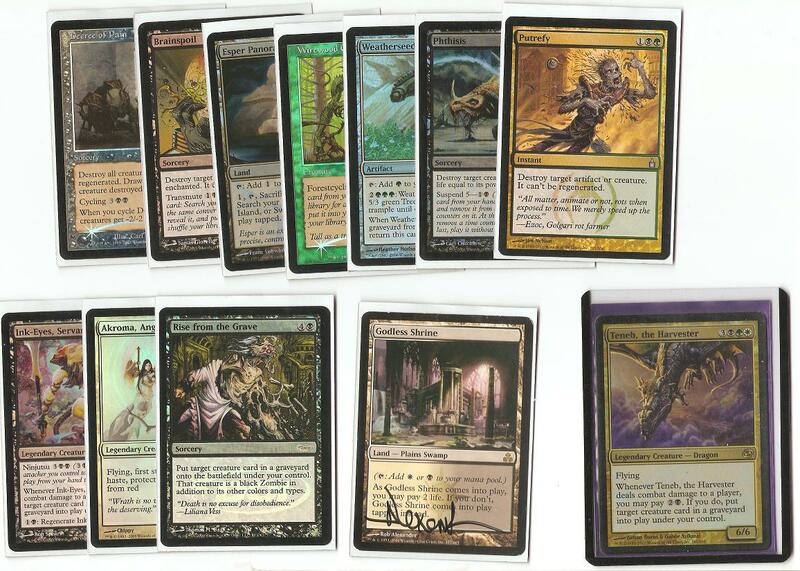 The foils, and the foreign, and the signed, and the altered, and the rare hardly ever printed version of the card. These are the pimps of EDH. Because most EDH decks don’t change very often, there’s incentive to pimp out your deck. Over time, you’re less likely to change out a card for something else. While you see this in other formats as well, it’s more prevalent in older formats because of the same philosophy as well. In Standard, you could change your deck once a week, hardly worth the time and effort to make it all foil or foreign (unless you really want to or have access to cards like that). Now, if you like a deck you’re playing and you want to star to “pimp” it out, where do you start? Easy, wherever you want to. If you see a foil in a trade binder, trade for it. Is an artist coming to a pre-release in your area? Take some cards to get them signed. Know someone who likes to doodle on cards? Pay ’em to draw/paint on your card. There is no right or wrong way to pimp your EDH deck. 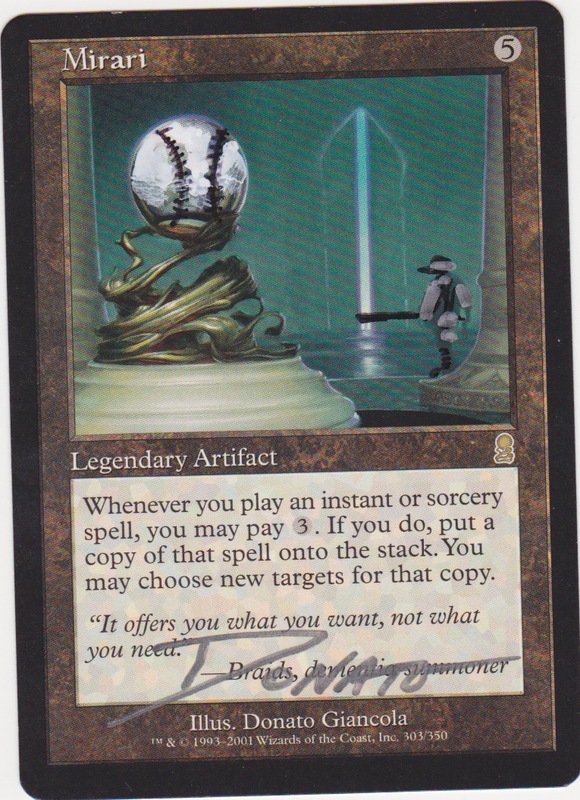 I’ve seen cards that have funny art on them, art that continued out of the frame, foils, foreign, you name it. It’s your deck, make it how you want. Of course, there’s no pressure as well either. This is just a mentality thing and if you don’t have the funds or interest to do anything to your EDH deck, there is nothing wrong with that. Sometimes it’s nice to look at someone else’s pretty cards. Which is what exactly what we’ll do now. First up we’ll take a look at @jakekessler‘s Teneb EDH deck (Click on all of these images to see the full size (opens new tab/window)). Foil Decree of Pain, Brainspoil, Esper Panorama, Wirewood Guardian, Weatherseed Treefolk, Phthisis Puterfy, Prerelease Ink-Eyes, Duel Decks Akroma, Promo Rise from the Grave, Signed Godless Shrine and Foil Teneb. 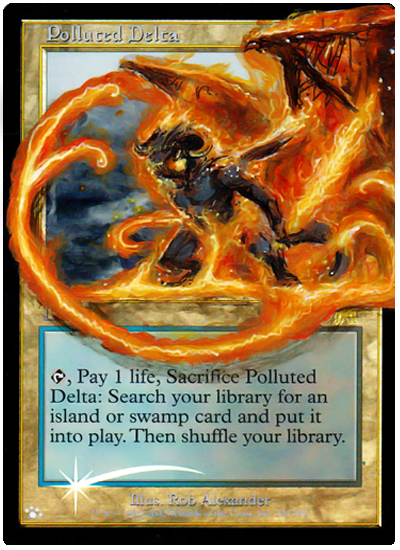 When talking to the EDH players in my area, most of them say one thing: if you’re going to have an EDH deck, at least have a foil General if possible. 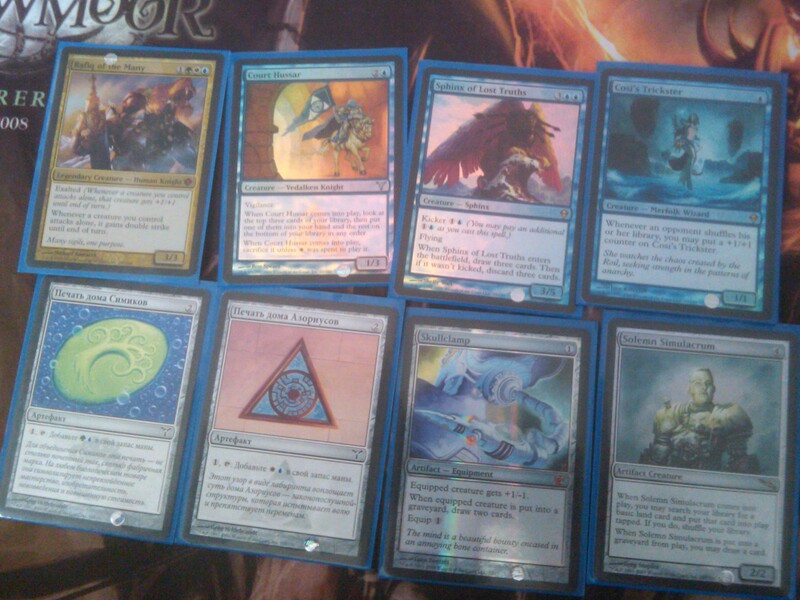 Here’s a collection of foils I found while talking to a guy named John at States09. He had acquired these cards to put in various EDH decks. Yeah? Yeah. I’m trying to see if I can pry that Crop Rotation from him. So, if you’re trying to take a page from Quiet Speculation‘s book, know what foils get used for EDH. 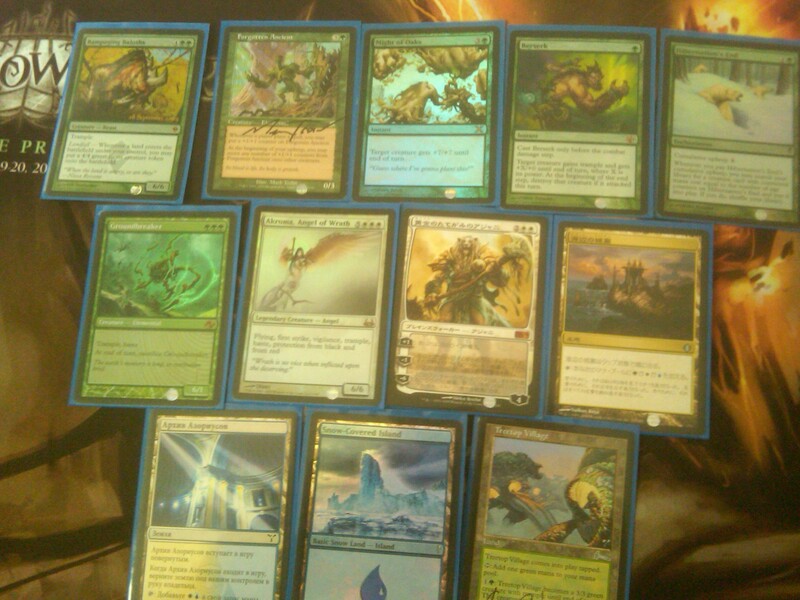 Some of the new FNM foils hold their own in this format (Lightning Greeves is very very popular). The reason why FTV:E is so expensive, promo foils of EDH used cards. Foil Generals will most likely be sought after. Foil Rafiq of the Many, Court Hussar, Sphinx of Lost Truths, Cosi’s Trickster, Russian Sismic and Azorius signets, FtV:E Skullclamp, foil Solemn Simulacrum. Japanese Ardent Plea and Favor of Overbeing, Pre-release Overbeing of Myth, foil Finest Hour, Aura Shards, Release Knight of New Alara, foil Qasali Pridemage, Rhox War Monk, Steel of the Godhead, Pre-release Questing Phelddagrif, foil Behemoth Sledge, foil promo Steward of Valeron, foil Plaxcaster Frogling, signed Cold-Eyed Sylke, foil Glare of Subduel, Wilt-Leaf Liege, Japanese Murkfiend Liege. Sure, not all of it’s foil, but over a third of it is. It does take time to acquire all of these things. Don’t worry if your deck doesn’t look like this. There are some decks where I’m completely jealous. Not all the cards have to be expensive or done so seriously. 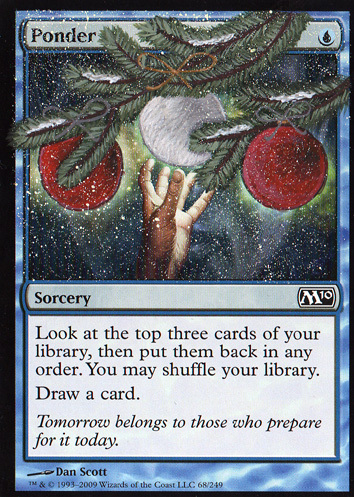 Here’s something Samahel on MTGSalvation did by themselves for the holiday season. Or, if you’re lucky enough and ask nicely enough, you might be able to get the original artist to doodle on it (hint: some artists will do this for a fee. If you get one of them to do it during a pre-release, buy something from them). Here’s MTGS’ Makingmoves’ Mirari altered by the artist. Of course, everyone has their own take about how they want to pimp out their deck. It’s all up to you, and that’s the great thing: you don’t have to follow anyone’s lead. If you want to alter every card in your EDH deck, or get all of them foreign, or whatever, do it. And now, for the grand finale. 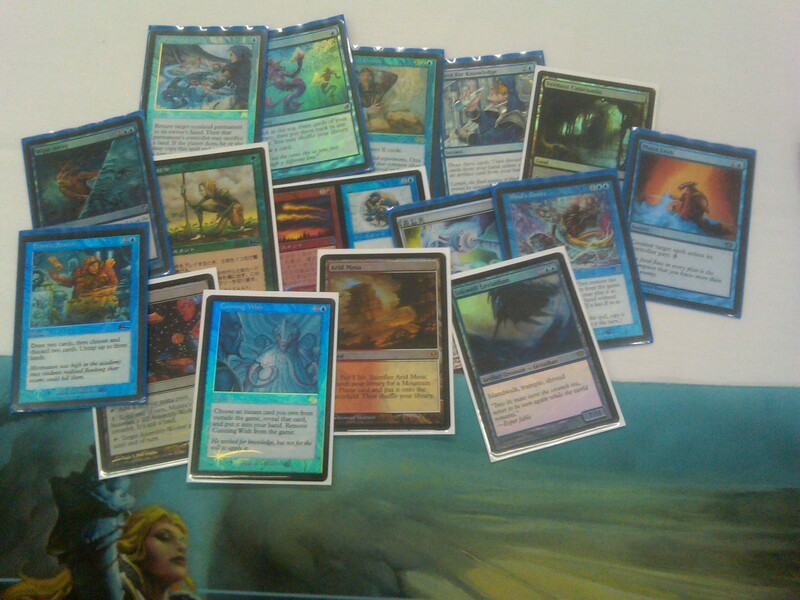 @MTGMetagame (his blog) was nice enough to pass along this pic to me. I would to point out that everyone has their way of doing things; this is his. Reminder: this is all for his Uril EDH deck. One deck. 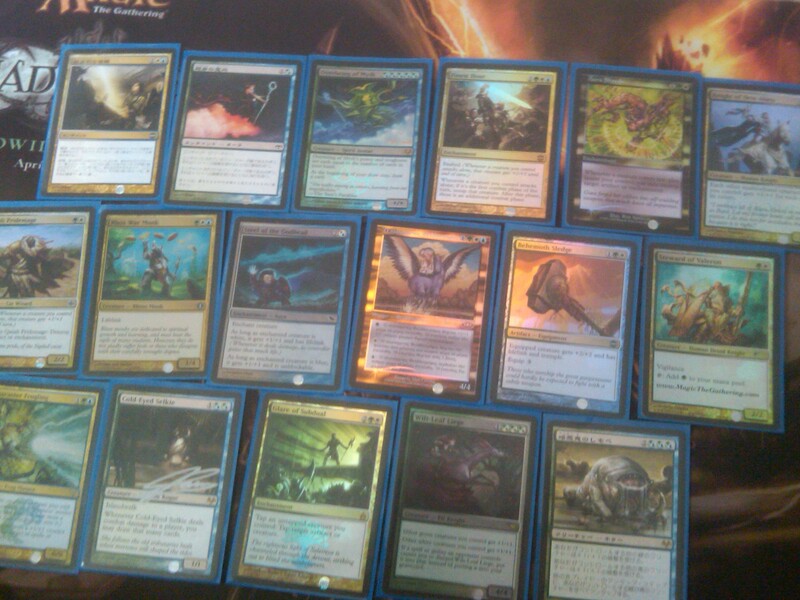 Favorite card: Bottom row, 7 from the left: Foil Japanese Baneslayer Angel. 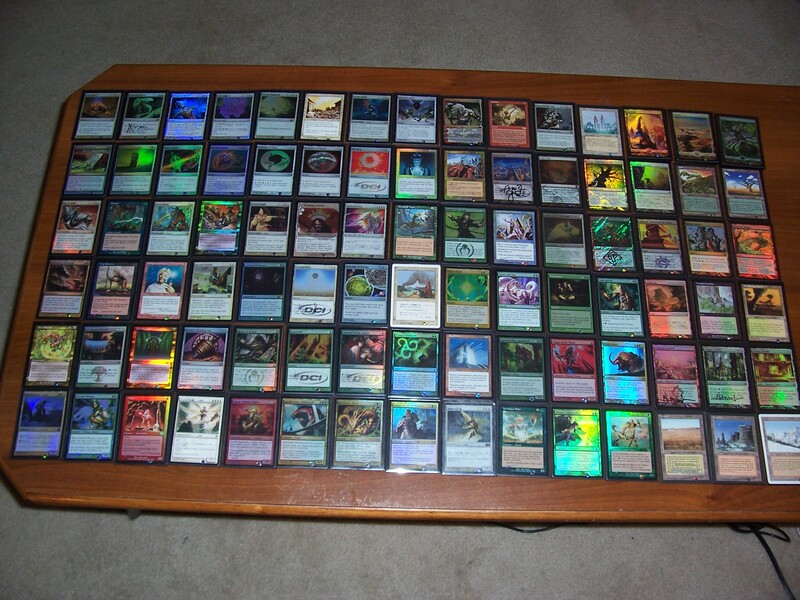 If you’ve got Pimp EDH cards you want to share (obviously it doesn’t have to be like MTGMetagame’s) send me your pics or scans: 99EDHProblems ATgmailDOTcom. I’ve got more of my cards to show, and I’m sure you want to show your deck. 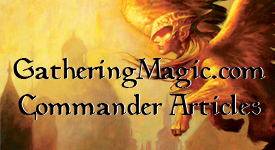 This entry was posted on Friday, December 18th, 2009 at 4:03 pm	and posted in EDH, Magic: the Gathering, Pimp EDH. You can follow any responses to this entry through the RSS 2.0 feed. I see this done quite a bit with Cubes and Type 4 stacks as well. I have been picking up cool foils for a while now when trading for my type 4 stack, my cube, and my edh stockpile. 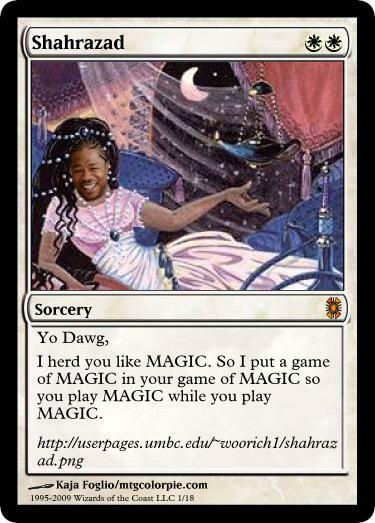 I’m foiling out my Rafiq deck as well. I’m a little over half way there but am having the hardest time sourcing the commons and un-commons especially. Generally at events players being their foil rares but no uncommons/commons. 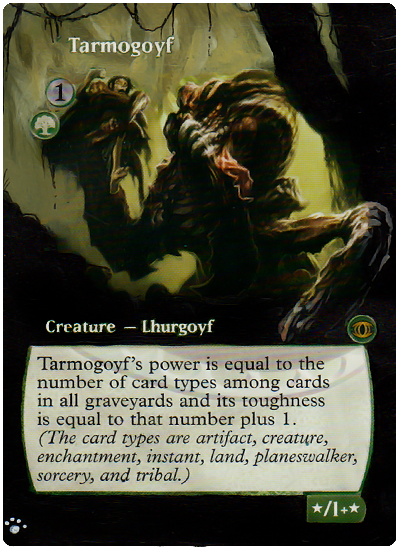 In addition, anything that’s from Urzas up to Invasion is really hard to find or anything that’s commons in Cubes is scarce as there’s a second target group buying up the same cards: Karoos, Signets, Common Artifacts.